to communicate with his wife, Christine. Wayne Carter was born and raised in Arkansas. In 1978, just after high school, he joined the US Army, and was stationed throughout the world in Germany, Korea, and Hawaii. In 1984, he returned to Arkansas and reconnected with a former high school friend, Christine. They were married several years later. The Army eventually stationed him in Los Angeles. The Carter's loved the Southern California sunshine and decided to stay. After retiring from the military, Carter studied locksmithing, while while working as a security guard. He was the top of a class of fifty students. In 2004, he began to develop unusual symptoms in his right hand. "Wayne would complain about pain in his fingers and wasn't able to write,' said his wife Christine. "He couldn't hold a pen or fill out his nightly reports." She advised him to see his doctor at the VA. Many tests were run on his hand, as well as blood tests, xrays, MRIs and others. Several weeks later, his doctors asked him to come in to discuss his case. 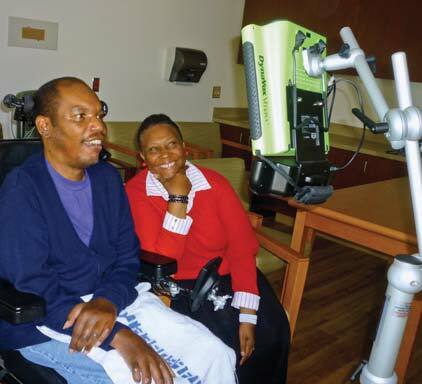 They presented him with his diagnosis – he had ALS, also known as Lou Gehrig’s disease. “There were five doctors there, and they all looked so sad," Christine shared. "They repeated the diagnosis several times, and said they thought Wayne would likely only live about two years." "I told the doctors that I heard what they had said, but that I just couldn't accept it. It was a really, really sad day." Carter continued to work at his job throughout the rest of the year, until his legs began to get weak. "He was such a hard worker and never missed any days," Christine said. "His job meant a lot to him. But, then he started falling a lot and we knew it was time for him to stop working." Christine was working as a manager of a nursing registry, but she left her position in order to take care of her husband. 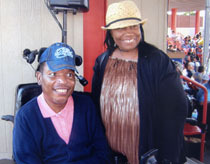 The Carter's connected with The ALS Association Golden West Chapter, after attending an educational event at Cedars-Sinai. "All I knew about ALS before that day was from the movies, " Christine said. "It was great to meet other people living with the disease and their families." 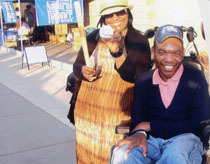 Christine and Wayne formed a team which they called “Lift Me Up” for the 2004 LA County Walk to Defeat ALS. Their team has returned to raise funds to support our mission priorities every year since. They also have participated in many other Chapter events and activities, working to spread awareness about ALS in their local community. 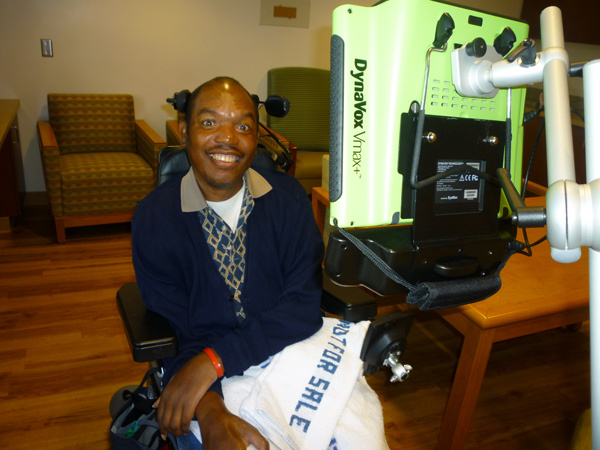 Carter's disease has continued to progress and he has been using his DynoVox communication device for the past two years. His story is an inspiration and has been featured in articles in Paralyzed Veterans of America magazine and DynoVox's Success Stories. As his primary caregiver, from the time her husband was diagnosed, Christine feels it was a blessing to be able to take care of him. “He is just a joy to be around,” Christine Carter said of her husband. "It is a disease that takes more and more from a person, every day. But, I always tell Wayne to keep fighting." "For those facing the disease, I know it can be hard. You get tired and you just don’t know what to do. But, don’t give up! It is very important to still do things in the world." "Caregivers, you need take a break from time to time. For me, staying connected to my friends, my church, and the Chapter has helped tremendously. Please remember to keep a positive attitude. It is one of the best ways to fight the fight the disease." at the MLB Urban Youth Academy stadium in Los Angeles benefiting The ALS Association Golden West Chapter.